Lica Land Premier marked a special milestone in the construction of Dusit D2 Hotel and Residences with a topping-off ceremony held last June 16. This major landmark which is targeted to open by the second quarter of 2018 is set to be an integral part of the Bonifacio Global City landscape. (L-R) Jonas O. Senia (General Manager - Lica Management,Inc. ), Efren Reyes (Owner, RBG Builders), Reynaldo Santos (VP-Operations,Global Project, Incorporated GPI), Rolando Evangelista (Owner, Global Project, Incorporated GPI), Arch. Ariel Francisco (Facade Consultant - W.V. Coscolluela & Associates), Bernice Baculi (AVP Operations - SM Aura Premier), Felix K. Limcaoco III (Managing Director - Lica Management, Inc.), Engr. Alfred A. Ecaldre (Head, Lica Engineering and Design-LEAD), Engr. Estroly R. Flores (Construction Manager - Gravitas Project, LEAD), Engr. Virgilio Miguel (Senior Project Manager, D. A. Abcede & Associates, DAAA), Engr. Jason A. Pabello (Project Manager, DAAA). Dusit D2 Hotel and Residences is a prime property managed by Dusit International, a prestigious hospitality brand with 65 years of world-class hotel experience. It is the only residential development integrated with the prominent SM Aura Premier and the Aura Tower. 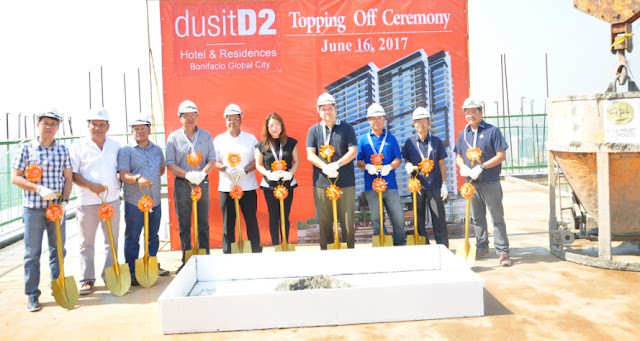 This 27-storey mix-use development features DusitD2 Hotel, Dusit International Manila Hospitality Management School (DIMHMS), and designated floors for the Serviced Residences which will prove to be an intelligent choice for the savvy investor. For inquiries and further details, please contact Lica Land Premier at landline no. (02)984-3921 or mobile nos. 0927-0492278 / 0949-3730202.